As promised, this post explains the card game Blackball, as played by my family during our 2016 Family Olympics. I asked Trevor to write out the instructions for me and here's what I received. Let me know if you have any questions. It's really not all that complicated, but explaining it is a little tricky. The number you wrote shows how many tricks you think will win. For round 1, the only choices are 0 or 1. To play, the person to the left of the dealer shows his card. Then each person clockwise shows theirs. The highest card in the suit that was lead takes the trick. However, if a trump card is played, it wins. If more than one trump card is played, the highest one wins. If your guess was correct, then you add a one before the number and you get that many points. So a guess of 1 becomes 11 points. A guess of 0 becomes 10 points. If your guess is wrong, color in the number you guessed and make it a black ball. It's worth 0 points. Then you play the second round. The deal passes to the left. 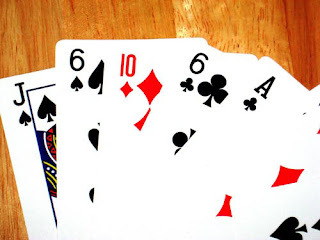 This time everyone gets 2 cards and you guess whether you'll take 0, 1, or 2 tricks. Like before, the person on the dealer's left starts by showing one card. Everyone else plays a card in order clockwise. You have to play the same suit the dealer led if you have it. The person who takes that first trick leads the second card. After the two tricks, you put a 1 before your guess if you guessed 0, 1 or 2 correctly. If you guessed incorrectly, draw a black ball over your guess. The deal passes to the left after each round. For round three, you get three cards and there are three tricks, so you guess whether you'll take 0, 1, 2 or 3 of them. For rounds 4, 5 and 6, you get that 4, 5 and 6 cards and there are 4, 5 and 6 tricks. When you get to round 7, each player gets 7 cards, but there is no trump. The next round goes back to 6 cards with a trump. You work your way back down 5, 4, 3, 2, and finally 1 card for the final round. After the 13th round, add up your points. The maximum possible is 179 points, which would mean that you took every single trick in the game and guessed correctly that you would for all 13 rounds. The lowest possible score is zero, which means you guessed incorrectly for all 13 rounds.